Humanist Alliance Philippines, International (HAPI) and Department of Environment and Natural Resources (DENR) organized another Manila Bayside Clean-Up on June 2nd of 2018 at Las Piñas-Parañaque Critical Habitat and Ecotourism Area (LPPCHEA). In attendance were members of the Metro Manila Chapter, beneficiaries of Kids Nutrition Campaign and Secular Humanist Advocacy Development and Education (SHADE), and other volunteers. On a mission to be one with Mother Nature through a treasure hunt like no other, volunteers squatted, lunged and collected trash at the national capital’s only wetland and endangered bird sanctuary. Notable was the participation of tens of riders of Angkas Padala, a same-day delivery service provider; some private individuals who signed up for the event through iVolunteer.com.ph; social media influencer and film director Bani Logroño; and Mister Earth Philippines 2017/2018 Carlo Roy Gorospe Roslinda. 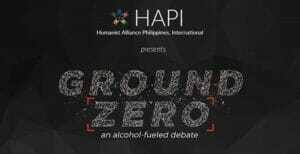 Manila Bayside Clean-Up is a series of quarterly clean-ups under the Green Movement program of HAPI. The collective effort was opened to all ages and genders, with the theme, “Only humanity can save humanity”. During the opening program, National Events Director McJarwin Cayacap introduced the volunteers to the virtue of environmental Humanism and its embodiment in the nationwide efforts of HAPI as a non-profit organization. A pep talk by Chief Financial Officer Edwin Bulaclac, Jr. followed, encouraging participation in upcoming HAPI projects. LPPCHEA is the first critical habitat to be declared in the Philippines. Covering around 175 hectares of wetland ecosystem, it consists of two islands — Freedom Island and Long Island — with mangroves, ponds, lagoons, mudflats, salt marshes, and mixed beach forest all over. Also recognized as a wetland of international importance by the Ramsar Convention because of the critical role it plays in the survival of threatened, restricted-range and congregatory bird species, LPPCHEA hosts around 41 species of migratory birds in the area, with some coming from as far as China, Japan, and Siberia. During the migration season between August and April each year, the area is transformed into a feeding and resting area for birds making their way to the warmer regions of the globe. More than expected, over twenty sackfuls of commercial wastes and non-biodegradable materials mostly made up of plastics were collected by the volunteers. Other than the horrible look of the bayside, disappointment was written on the volunteers’ faces as they take breaks and behold the vast sewer-like body of water before them. In a few meters from the clean-up area are thriving mangroves — an unfortunate contrast that Filipinos must change. The clean-up is a constant reminder to local citizens that a liveable environment is a human right. After 4 hours of tiring yet fulfilling clean-up, the volunteers were awarded Certificates of Participation for their involvement with such a noble cause. Going forward, the Metro Manila Chapter has committed to awarding electronic certificates to its volunteers in order to help in reducing carbon footprint and paper consumption. As of this writing, the Metro Manila Chapter has received notice of interest from certain organizations and Corporate Social Responsibility (CSR) teams for the 3rd Manila Bayside Clean-Up which will coincide with World Cleanup Day 2018 by Let’s Do It International. September 15th of 2018 shall see five million volunteers in the Philippines, standing up against the global trash problem and cleaning up waste. With simultaneous environmental activities happening in 150 countries in one day, World Cleanup Day is expected to be 2018’s biggest civic action. Green Movement is the advocacy arm of HAPI that promotes human welfare and social reforms through small thoughts and doable acts of kindness for the environment. Pegged as one of the major and recurring projects of the Metro Manila Chapter beginning in 2018, Manila Bayside Clean-Up is a quarterly effort that hopes to attract bigger participation by humanists or atheists, and continued collaboration with stakeholders in the capital. Humanism is a sound basis for genuine environmentalism; it prioritizes the mortal life and the ethical responsibilities that come with it. Not only human-centric, Humanism also seeks the preservation of all life and takes on the mission to expand the circle — the range of creatures who deserve respect and humane treatment. “Humane-ism” is absolutely among the top principles and priorities of Humanism. Through its Green Movement, HAPI is ever more active in protecting environmental resources and Earth’s fragile ecologies. Guest Blogger: The Filipino Culture of Pandering to Ignorance.